Grilling this Soy Brown Sugar Salmon in Foil makes for an easy weeknight dinner that is impressive enough to serve as weekend fare for guests. The salmon is first marinated in a simple marinade, the sealed in foil and grilled (or baked!) for about 15 minutes just until it flakes apart! Combine all marinade ingredients in a small bowl. Place the salmon in a large zip-tight bag or shallow glass baking dish and add the marinade, turning to coat the fish entirely. Seal tightly or cover with plastic wrap and marinate in the refrigerator for 1-3 hours. Preheat grill to medium-high heat. 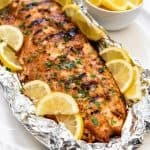 Take a large piece of heavy-duty aluminum foil and remove the salmon from the marinade, laying it skin side down in the center of the piece of foil. Fold the long sides up and then over themselves, repeating with the short sides, to create a sealed packet containing the salmon. Transfer the foil-wrapped salmon to the hot grill over indirect heat not directly over the flames and close the grill lid. Cook for 15-18 minutes until almost entirely cooked through. Brush the grill grates directly over the flames with a little oil, then carefully open the foil packet and using one of the long edges of the foil, and flip the salmon directly onto the grill grates over direct heat to char the top. Grill just until cooked through, and grill marks appear (1-2 minutes) being careful not to overcook, the use two large spatulas to remove the salmon from the grill. Transfer to a serving platter and garnish with chopped parsley and lemon wedges before serving. If you want to bake the salmon in the oven, heat the oven to 375 degrees F., then bake, wrapped in foil just like on the grill, for 15-20 minutes.